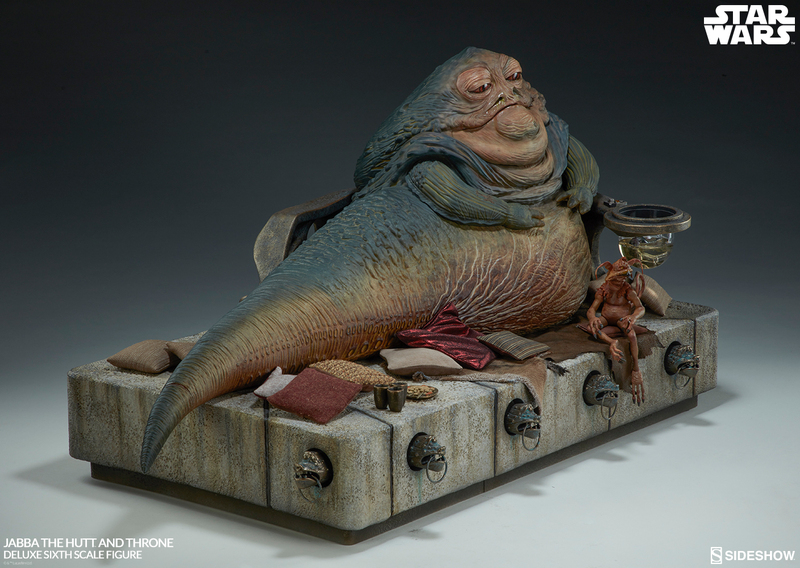 Sideshow Collectibles just announced via a YouTube video that they are going to be releasing a brand new 1/6 scale Jabba the Hutt figure, complete with a throne and Salacious Crumb figure! And it’s up for preorder today at a price of $795 (with a non-refundable deposit of $79.50), for delivery in the fourth quarter of 2018. I am amazed that they are actually doing this. 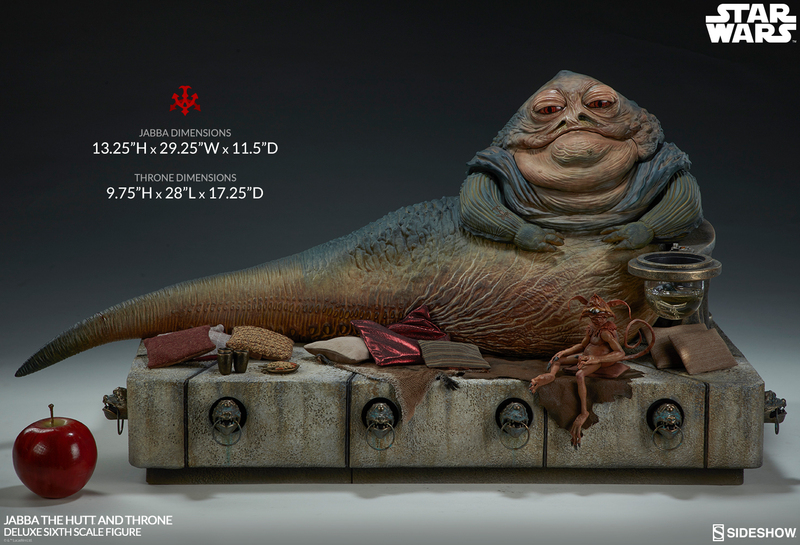 I thought maybe Hot Toys would make one at some point, but it seemed unlikely that Sideshow would just do a revamp of their original Jabba setup from 2007. But here we are. 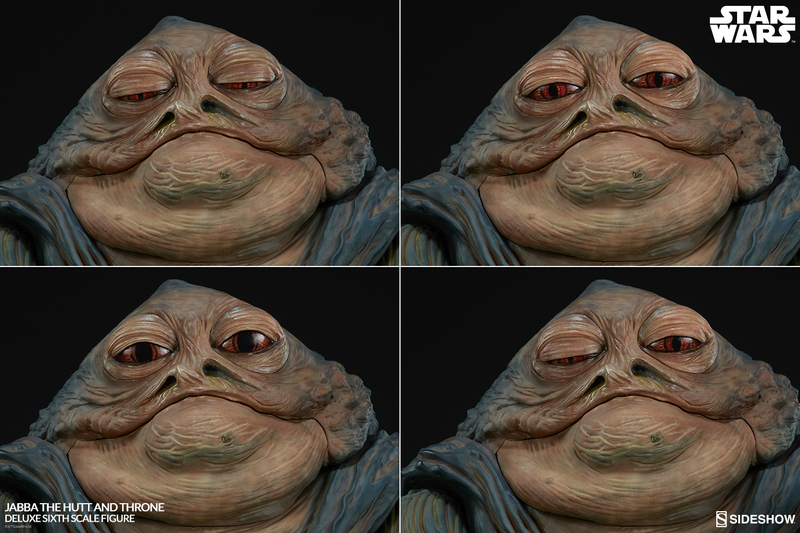 Between this and Hasbro’s sail barge, I am starting to wonder if there isn’t some truth to the rumors of a Jabba the Hutt standalone movie in the pipeline. At first glance, it looks very impressive, with multiple sets of eyes (including sleeping eyes! ), hands, and mouths to help evoke his various scenes and emotions. I’m not sure at this point if the arms can actually be posed or just swapped. It’s sounding like it’s the latter. He seems to be entirely made of PVC plastic, which is not too different from the first vinyl figure they made, but he does appear to be more detailed. The paint job looks very impressive (although it seems almost cartoony in the shot above). Of course it is a prototype in the photos, so who knows how good the final production piece will look. The throne is also pretty amazing looking — even better than the original throne, which was already quite impressive. The $795 does give me pause (although to be honest I was afraid it might be even higher when I first saw the piece). The original figure from 2009 cost $119.99, but was sold separately from the throne ($199.99) and the two creature packs that were available ($39.99 and $32.99). So total retail price for the entire setup would have been $392.96, or just about half the cost of this new version. But when you consider that Sideshow’s normal 1/6 scale figures used to cost around $55 and now they cost well over $200, this increase in price probably shouldn’t be a surprise. And to be fair, this does look somewhat nicer than the original set as well. Incredibly, there are now two Jedi Luke figures up for preorder that could fit into this display. One is from Hot Toys and the other is from Sideshow and can be made into three different versions of Luke. 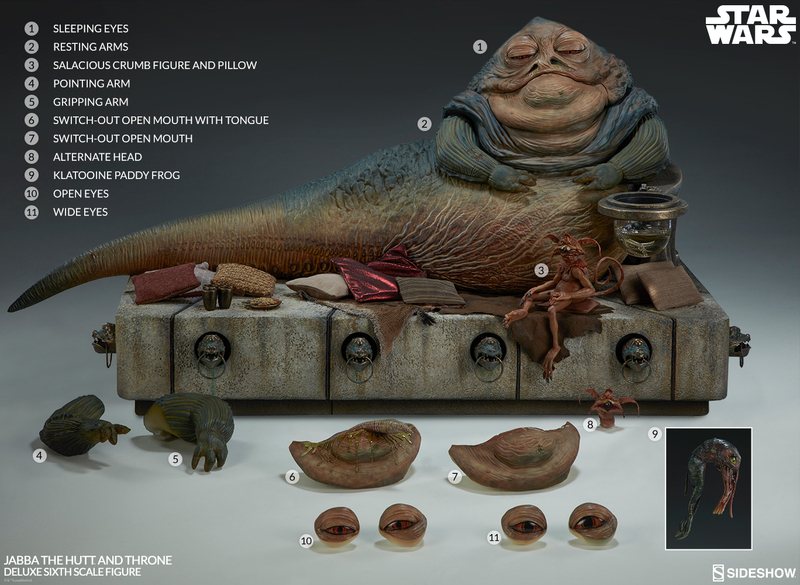 Although I have largely stopped collected 1/6 scale figures due to the cost and waning interest on my part, I have already placed my order for the Jabba set. I can’t wait! 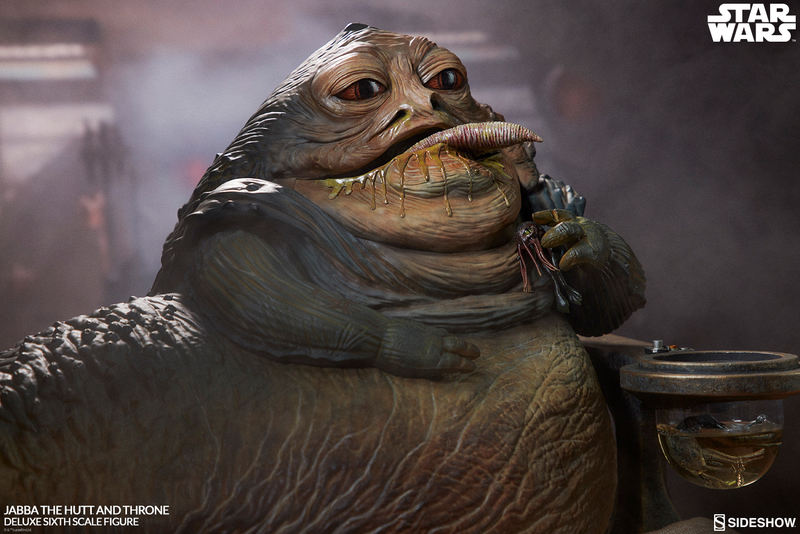 Congratulations, Mighty Jabba. I was wondering if you’d order this. I must say that it looks pretty impressive and i’m looking forward to seeing some in hand photos.